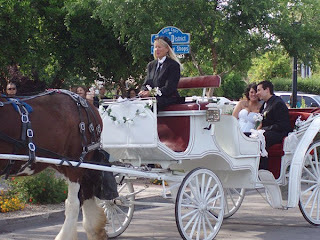 A business in the area of our venue offers horse-drawn carriages for special occasions. Pictured above is a bride and groom who actually used the service on their wedding day. I think the idea is SO cute. If we were to use it, I would have to figure out how to time it. The ceremony and reception are in the same place, so where would we travel to? I could use it riding up to the ceremony, but that would mean I would get ready in the bride's dressing room, attempt to sneak out of the back and into the carriage and ride around to the front to make my entrance. The problem with that is the guests seating has a perfect view of the door I would sneak out of. Awkward. Lol. Maybe we'll use it at night, after the reception, to go away. I just thought it might look better to have a daylight backdrop for the picture of us in a horse carriage. It sure would make me feel Cinderella-ish. I checked out the prices, and there are only two categories for pricing. Weddings which cost $300 and Birthdays which cost $150. Lame! My birthday is five days before my wedding, so if I DO use the service, I'll be damned if I'm charged the $300, lol. On a side note, I'm even MORE glad that I decided to order my dress online instead of going with David's Bridal. I instantly recognized the dress of the bride in the picture above from the catalog AND in-store. Not knocking any ladies who do go with David's Bridal, because it makes sense, but it really seems to be the go-to place for Arizona brides (especially in the west valley).